7-Hour Tour by Foot, including Time for Lunch. All major sights of Ancient and Old Rome at a leisure pace. Skip the lines ticket to Colosseum. The tour has been designed for an active traveller who loves walking and wishes to get a very good overview of most important Roman sights, all in a day tour. We will start from visiting the Colosseum (skipping the lines) and climbing it upper piers. We will than walk past the Arch of Constantine to the Palatine Hill, once the residence of the ancient rich and powerful. The views are breathtaking; from the Bath of Caracalla to the Circus Maximus and the Aventine Hill and onto the Roman Forum under our feet. We will stop at the Arch of Titus than descent onto the Roman Forum with the ruins of its ancient temples, the Senate House and the Rostra, from where most important speeches were given. Upon leaving the Forum we will call at the Mamertinum Prison where St Peter and St.Paul spent their last days. A short climb will take us to the Capitol Hill, the most famous of the Roman hills. The Rome Town Hall designed by Michelangello is the seat of Romes major today. We will walk down the hill by the Tarpean Rock where the traitors of the Empire had been executed and reach the Theatre of Marcellus and the area of Jewish Ghetto. We will stop for lunch in a typical Roman trattoria and than continue to Piazza Farnese with Michelangelos wine-draped overhead walkway. Then we will pass on to the famous Campo dei Fiori, the heart of Roman social life. 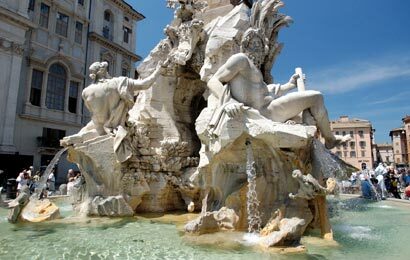 We will continue to Piazza Navona with Berninis Four Rivers Fountain that is todays artists corner and from there to Pantheon once Roman gods temple built by emperor Hadrian. We will finally arrive on piazza Spagna, right at the bottom of Spanish Steps, making sure to put the legendary coin in the Trevi Fountain on the way.  Colosseum  Palatine Hill, Forum  Mamertinum Prison  Capitol Hill  Marcellus Theatre, Jewish Ghetto  piazza Farnese  Campo dei Fiori  piazza Navona  Pantheon  Trevi Fountain  Spanish Steps.